1: alcyon assembles l'alcyonette with a broad, flexible, and slightly raised ahndlebar. 2: ravat equips their racing machines with this double chainwheel of very light design. 3: helyett present a moped whose rear hub has a bohem pin, with 2 notched sides, teeth on the left for engine power and the drum brake, and teeth on the right to engage the bicycle chain. 4: captivante has chosen this original placement, underneath the bottom bracket, for the dynamo. 5: bertin placed the new lam hoods on the brakes of its competition model. 6: promo-vichy and luchien michard showed their beam-frame moped; the fuel tank is composed of the downtube and seat tube. 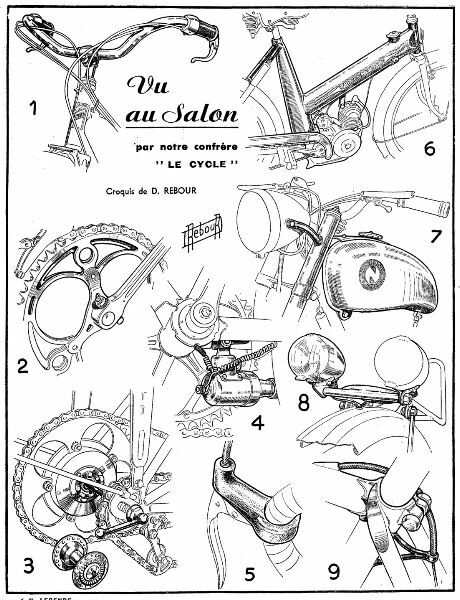 7: narcisse constructed this fork with a single tube mount for the headlight for its moped. 8: automoto attaches the twin headlights of its cyclotourist model to a small horizontal tube welded to the front of the rack. 9: liberia looks after its joints; the lug is chrome, as well as the seatstay end caps; note the rear brake cable stop.